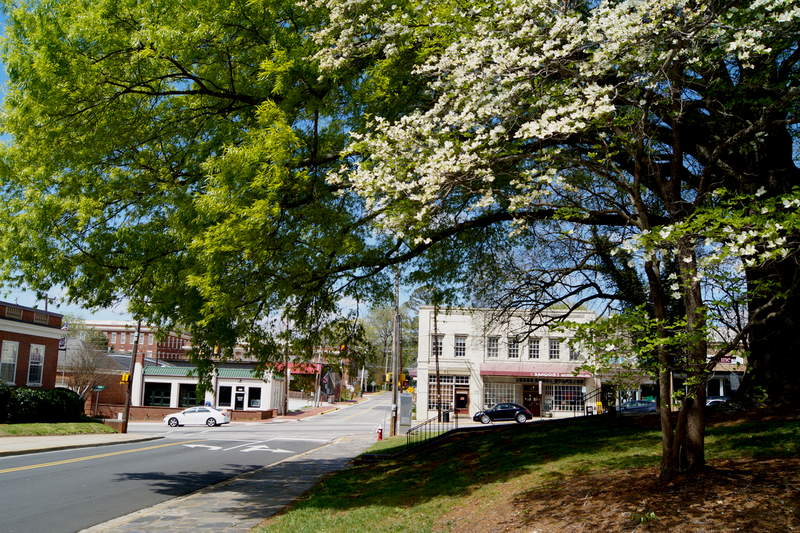 Hillsborough, NC is a charming little town right in the middle of North Carolina, and it’s practically dripping with history. We’re talking pre-Revolutionary War history, when towns were named for Earls (the Irish Earl of Hillsborough, in this case). And way before that, Native American tribes like the the Occaneechi and the Eno lived here. You can still see remnants of their old trading path right next to downtown. Nowadays, it’s an eclectic community minutes from Chapel Hill and Durham, with great restaurants and a friendly everyone-knows-everyone vibe. 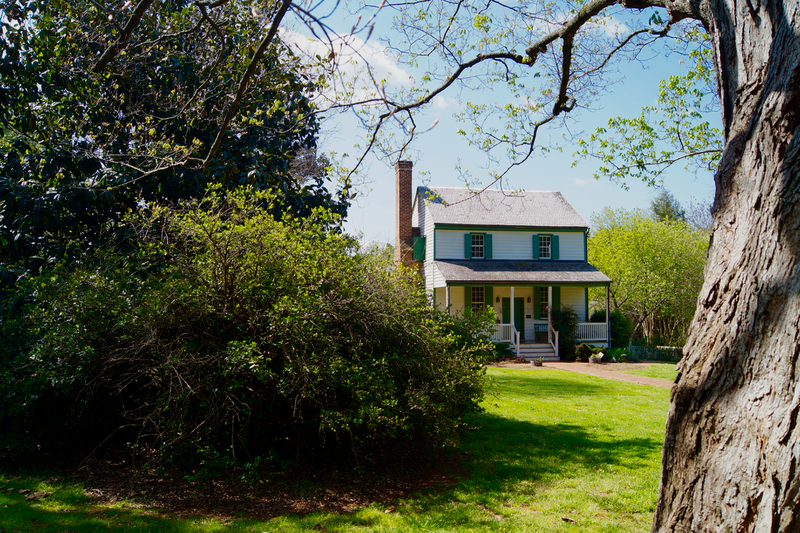 It’s a haven for writers and artists (North Carolina’s beloved Lee Smith lives here). 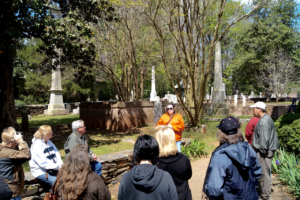 I recently took the “Second Saturday Walking Tour,” a $5 guided one-hour tour given by the Alliance for Historic Hillsborough. You can also purchase a self-guided tour book from them for $4, which has a map and information for more than 50 sights. Here are some of my favorite sights from the guided tour, plus a few others. This building also doubles as the Hillsborough Visitor’s Center, and it has a nice little museum inside. In the last days of the Civil War, late spring of 1865, Confederate General Wade Hampton and his troops camped on the grounds of the house (in its original location, a few miles southwest where it is today) before negotiating a surrender with Union General William Sherman at Bennett Place in Durham. The house was moved to its current location in 1983. (Fun fact: today a Wal-Mart sits by the original land). From the Alexander Dickson House, turn right onto E. King Street, and walk across Cameron Street, going up through a parking lot. 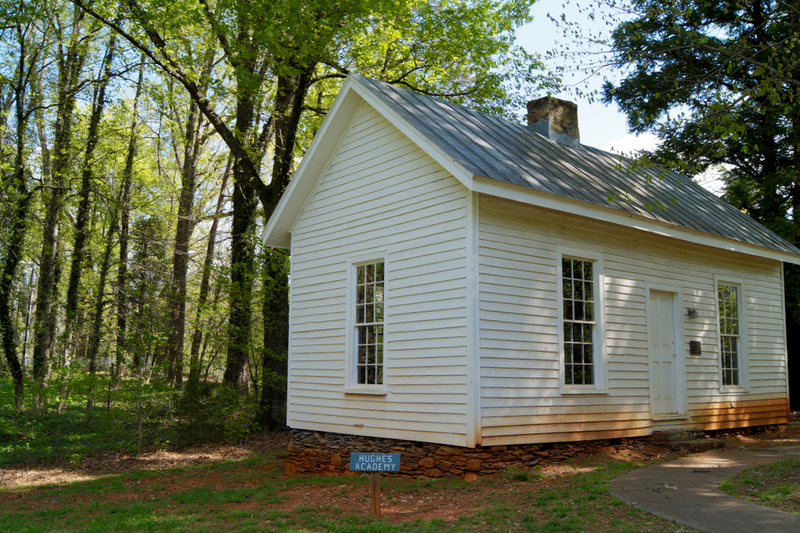 You’ll see a little white building – that’s Hughes Academy, which served as a schoolhouse from 1864 to 1884. Anyone who went through this school had automatic acceptance into the University of North Carolina at Chapel Hill (I’m sure today’s high school seniors wish it were that easy!). From this site you can also visit a memorial for seven men who were hanged in 1771 as part of the Regulator Movement, and you can see the remnants of a Native American trading path. From Hughes Academy, go back past the Alexander Dickson House, pass over Churton Street, and then look for the sign for Old Cedar Lane on your left. 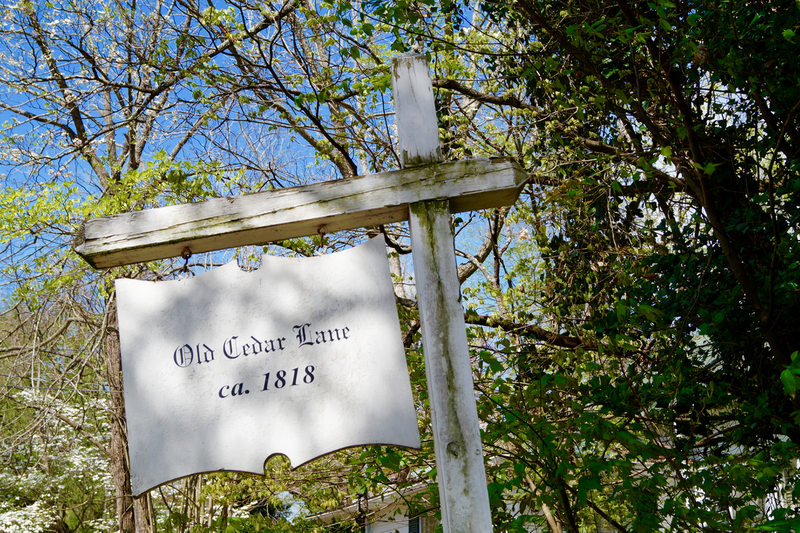 You won’t find Old Cedar Lane on any Google map. It’s a shaded footpath between King Street and Margaret Lane that two sisters (Mrs. Witherspoon and Mrs. Nash) used to walk back and forth to each other’s houses. And their husbands? They were half-brothers. There was no eHarmony back then. It’s a short path, but you can take your time and imagine what life was like for these two sisters and their families in the early 1800s. From Old Cedar Lane, head west down Margaret Lane, turn right onto Wake Street, then right onto Tryon Street. 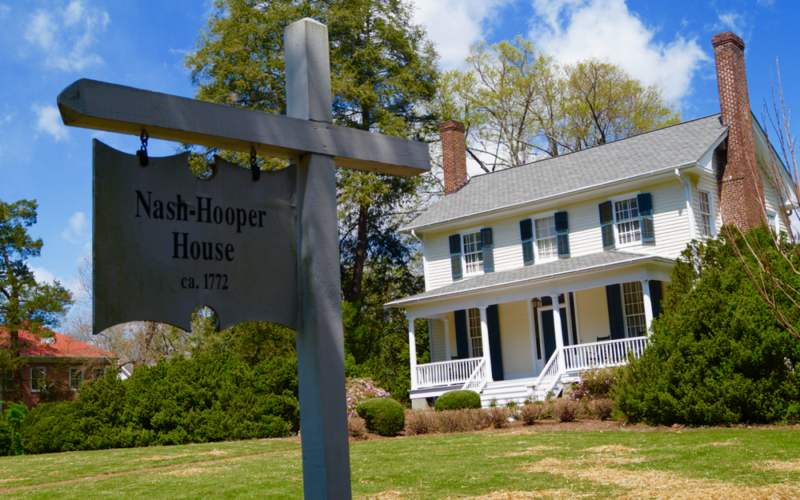 The Nash-Hooper House (now a private residence) is marked and will be on your left. Originally built in 1777 by General Francis Nash, who died in the Revolutionary War, the house was bought by William Hooper in 1781. William Hooper was one of three signers of the Declaration of Independence from North Carolina. The house stayed in his family until 1853. To get to Old Town Cemetery, head east on Churton from the Nash-Hooper House. This cemetery, surrounding the Presbyterian Church, has several notable North Carolinians laid to rest, including William Hooper and Archibald deBow Murphey (1777-1832), known as the founder of North Carolina’s public education system. UNC graduates will know him from Murphey Hall. If cemeteries interest you, then also check out Margaret Lane Cemetery (located in the 400 block of W. Margaret Lane), which was a burial site for slaves and was used by African American families into the 20th century. Continue east on Tryon Street out of the Old Town Cemetery. On the corner of Tryon and Churton, you’ll find the Orange County Historical Museum (201 N. Churton Street, free admission, see website for details). After perusing their collection of artifacts, documents and photographs, head to the Burwell School Historic Site (319 N. Churton Street). Admission to this lovely antebellum home and former boarding school for girls is free, and tours are available. 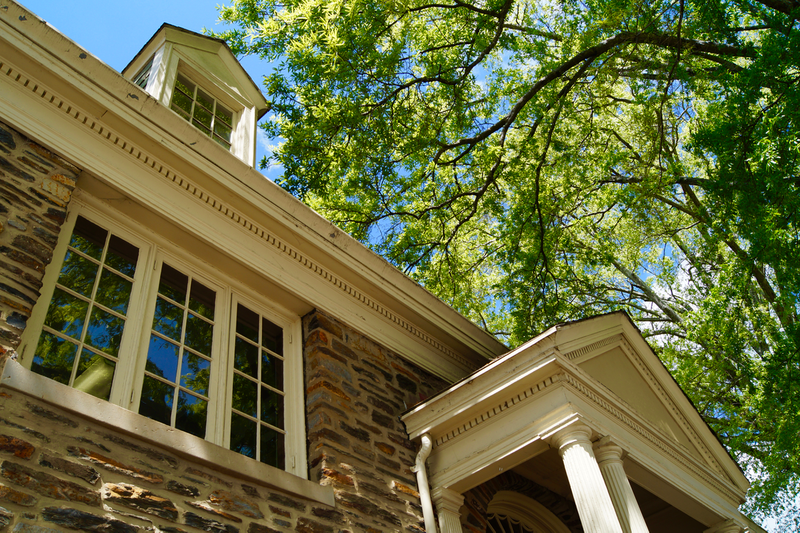 To get back to the starting point of this mini-tour (the Alexander Dickson House), head south back down Churton Street, enjoy some window-shopping, and stop in one of the restaurants to refuel. Turn left onto E. Margaret Lane, then left back up S. Cameron Street. Yep, there’s a slightly quicker way, but that’s the scenic route. If you’re up for even more walking, check out the Hillsborough, NC Riverwalk (115 Nash & Kollock Street, southwest of the Alexander Dickson House). This is a paved pathway that stretches 1.8 miles along the Eno River, and is part of the NC Mountains-to-Sea Trail. Lastly, you could hop in your car and do the one mile “Poet’s Walk” at Ayr Mount (376 St. Mary’s Rd. ), one of my favorite Eno River hikes. There is a Farmers Market (144 E. Margaret Lane) on Saturdays, so you can get your exercise and your weekly stash of fresh fruits and veggies. The Alliance for Historic Hillsborough also has a self-guided bike tour (here’s the map) and a guided Civil War tour (check the calendar for dates). Or looking for an evening walk? Check out the Last Fridays Art Walk, from 6-9 p.m. on Fridays. There are more than 100 historical structures in Hillsborough, NC, so you’ll have to go out and explore, and come up with your own mini-tours! There is something for everyone in this historic, and very walkable, town.